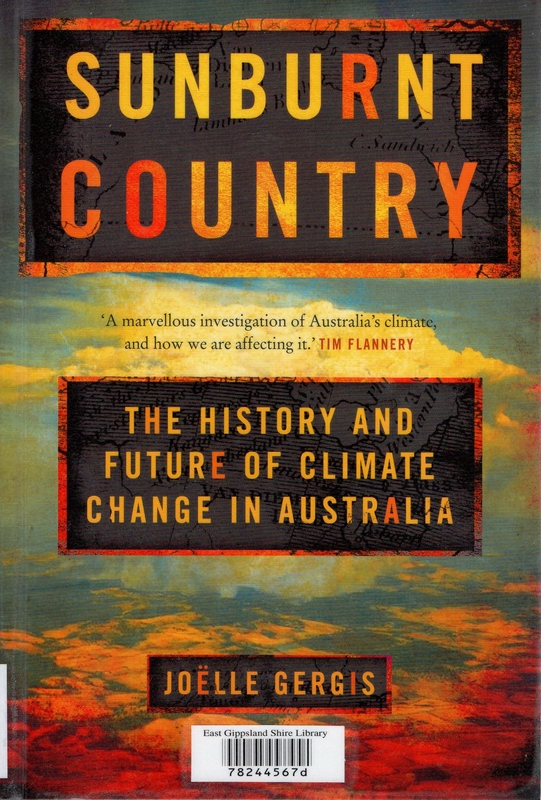 The Sunburnt Country: the history and future of climate change in Australia by Joëlle Gergis (MUP, 2018)* is a pioneering work on climate history. It is also an up to date work of the latest research on climate change (both natural and influenced by humans) in Australia over the last 1000 years. The book is divided into 5 parts commencing with an analysis of climate, mainly in south-east Australia since the first fleet. This part has an explanatory chapter (Australia’s Climatic Tug of War) about all the strong influences of extreme weather on our climate. In particular the El Nino Southern Oscillation (ENSO) giving us El Nino (hot dry) and La Nina (cold wet) weather patterns, the Indian Ocean Dipole (similar to ENSO in the Pacific) and much less so the Southern Annular Mode (describing north south movement of the Westerlies). Drawing on a wide variety of sources – anecdotal accounts, early temperature measurements, tree rings, coral growth, lake sediments and ice cores – the climate history of our country is established. Of interest is that the first years of European occupation were most likely an El Nino followed closely by a La Nina event from 1791-4. These were almost certainly natural climatic variations. However the influence of human greenhouse emissions on our climate may be much earlier than realised. We tend to think of climate change as something that may be experienced in the future whereas the reality is that we have been experiencing a gradual and barely noticeable warming throughout our entire lives. The book is quite readable for the lay person, yet authoritative. The bibliography is 16 pages long and there is a foreword by David Karoly of Melbourne University***. It is highly recommended. Buy two copies – one reference copy for your shelves and the other as some Xmas reading for your rellies or your local politician. ** I hope to deal with the specific Gippsland climate history using this book in a future post and in particular compare Gergis’ results to my own experiences over nearly 50 years. *** Karoly is clearly acknowledged as the author’s mentor. It is nice to know the work of this eminent scientist has continued over a long career. I have on my desk a copy of the symposium Greenhouse Effect: planning for the future (CSIRO, 1988) held at Monash University in 1987 in which he presented a paper.